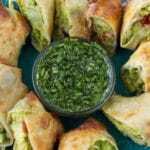 If you love avocado egg rolls, then you will love this healthier recipe for Cheesecake Factory’s Avocado Egg Rolls. Now you can enjoy your favorite appetizer at home without all the added fat. I’m a sucker for stuffing things in an egg roll and calling it an appetizer. So when I found out that Cheesecake Factory had an appetizer where they stuffed an avocado in an egg roll with a dipping sauce, I was on board. I recall for months trying to find a special occasion for us to go to Cheesecake Factory just to try this appetizer. We finally went, I tried it, and I was in love. I knew I had to make it at home but I kind of hate deep frying, especially now since I have my air fryer. And like magic it clicked, I have my air fryer. 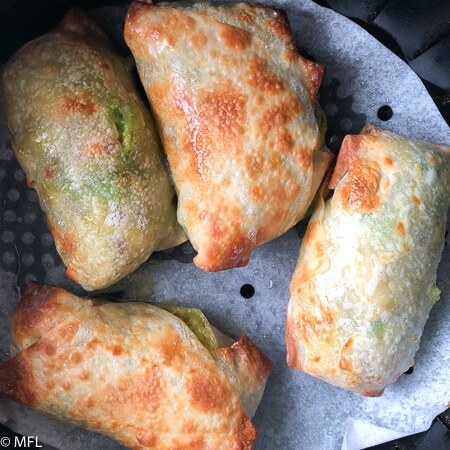 I can make these Copycat Avacado Egg Rolls right in my air fryer. Finding a perfect avocado is no easy task. Avocados ripen fast and if you aren’t careful, your avocado will go bad before you even get a chance to use it. I tend to check for firmness and the stem, making sure it is green. You can read more about picking avocados here. 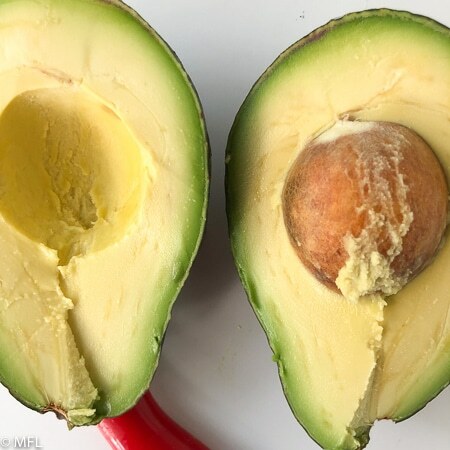 You’ll want to start by cutting your avocado in half, around the huge seed in the middle and separating it into two. Next, cut your avocado in medium sized square pieces, slicing the avocado but not cutting through the skin. I use a small paring knife. Lastly, you will take a spoon and scoop the avocado into the bowl. 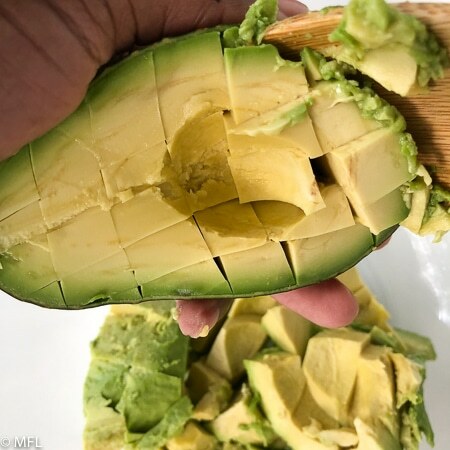 Your avocado should fall into the bowl in nice square pieces. Add all the inside of the egg roll ingredients to a bowl and lightly mix it together. 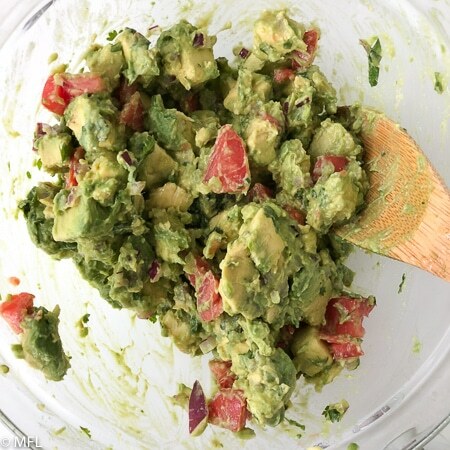 Make sure to carefully toss the ingredients and not allow the avocado to get too mushy. 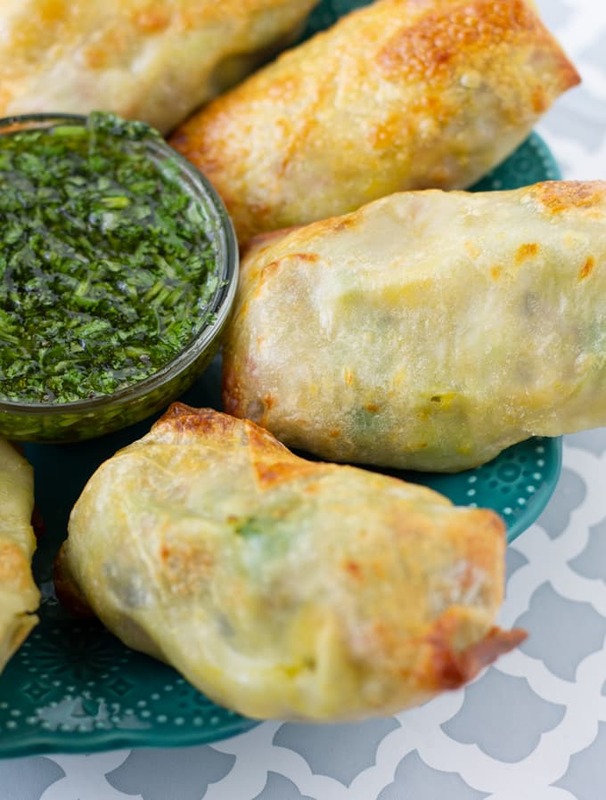 These avocado egg rolls turn out better when the avocado keeps the square chunky cut. Add the filling into each egg roll wrapper and roll them up. There is a science to rolling the perfect egg roll. Lay the egg roll wrapper in a diamond shape. Rub egg wash on the outer sides of the egg rolls wrappers. 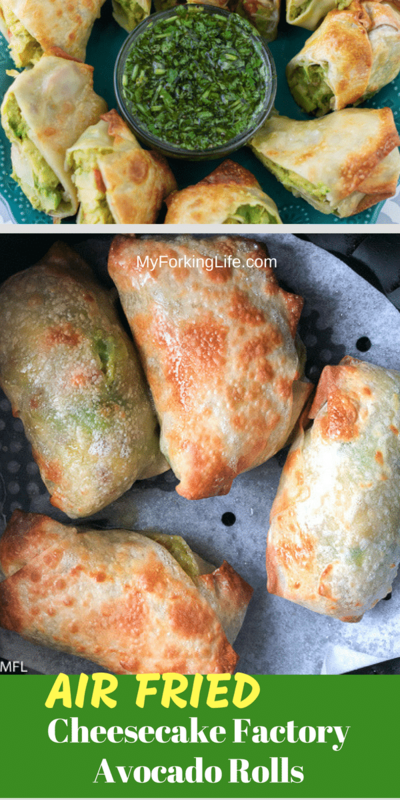 Fill each egg roll wrapper with about 1/3 cup of avocado filling near a corner. Roll the bottom corner up, completely covering the filling and fold in the sides. Roll the egg roll up, sealing it. This step is truly optional. I do it because I hate to waste the egg and I found it gives my egg a nice extra crispiness. Air Fry your egg rolls in a preheated 400 degree Fahrenheit Air Fryer. Cook for 10 minutes, flipping halfway through. Make sure not to overcrowd your basket. Find this tip and others in my 10 Air Fryer Tips. The dipping sauce is one of my favorite parts of this recipe. 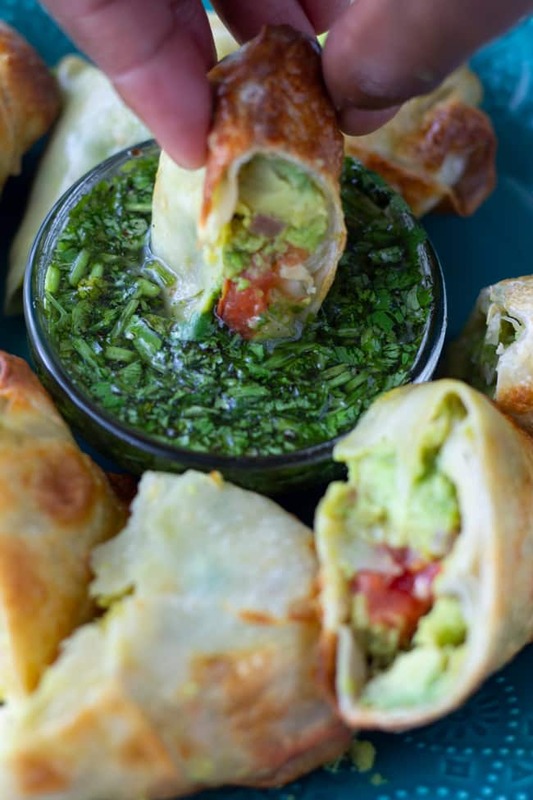 The Avocado rolls are good without it but are amazing when dipped in the dip. Just throw the ingredients in a small bowl and set it to the side while you create the rolls. Why are these Avocado Egg Rolls Healthier? According to Fatsecret.com, Cheesecake Factory’s Egg Rolls have 960 calories in each serving. Using an air fryer reduces the number of calories and fat by half. Looking for Other Air Fryer Appetizer Recipes? Try these…. 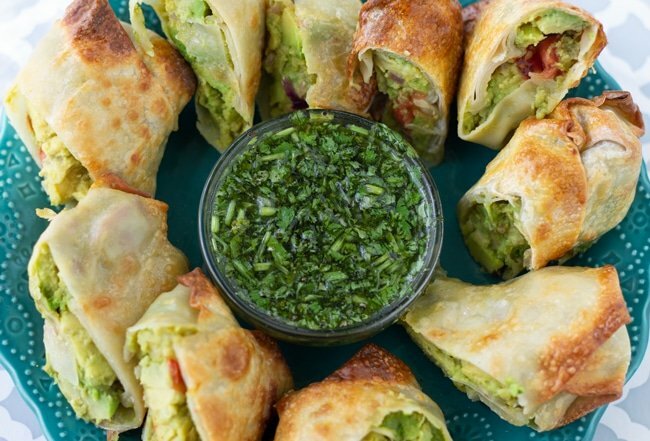 This Copycat version of Cheesecake Factory's Avocado Egg Rolls are much healthier than the restaurant version. You can have the same great taste and crunch with less fat by preparing them in the Air Fryer. 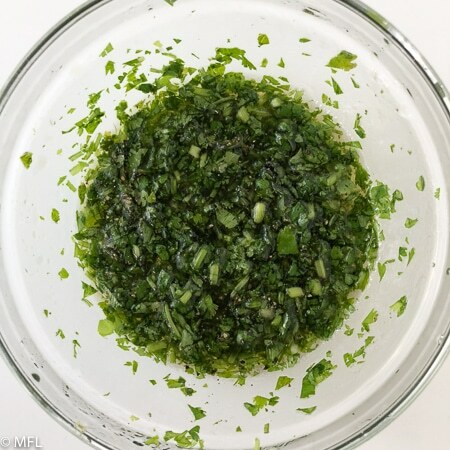 Combine Ingredients for Cilantro Honey Dipping Sauce and set aside. 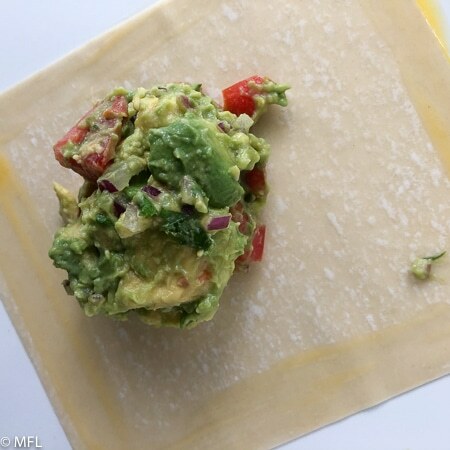 Prepare Avocado Egg Roll by placing avocado, Roma tomato, red onion, cilantro, garlic clove, and fresh lime juice in a large bowl and gently combine. Salt and pepper to taste. Use beaten egg and rub around edges of egg roll wrapper. 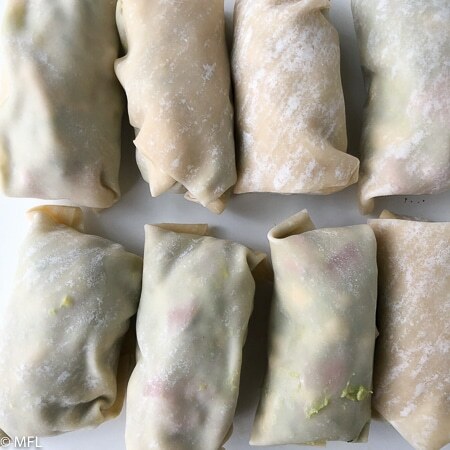 Place 1/3 cup of avocado mixture in each egg roll wrapper and roll, sealing the edge. Preheat air fryer basket to 400 degrees. Spray inside of the air fryer basket. Cook egg rolls for 10 minutes, flipping halfway. Remove and allow to cool. Egg rolls are done when wrappers are golden. *Spreading the remaining egg on top of the egg rolls is optional. I don't like the waisting the egg and I find it gives my egg rolls an extra brown and crisp color. *Never use aerosol spray cans in your Air Fryer. Invest in a quality oil spray bottle. Dipping Sauce Recipe Adapted from The Chunky Chef. Combine Cilantro Honey Dipping Sauce ingredients and set aside. Combine avocado, red onion, cilantro, and Roma tomaies in large bowl and gently combine. 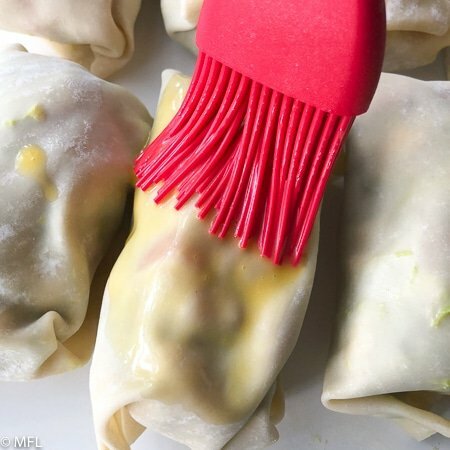 Place avocado mixture in egg roll wrapper and roll them up. Air Fry egg rolls in preheated 400-degree Fahrenheit Air Fryer for 10 minutes, flipping halfway. Thanks for this recipe, I can’t wait to try it! 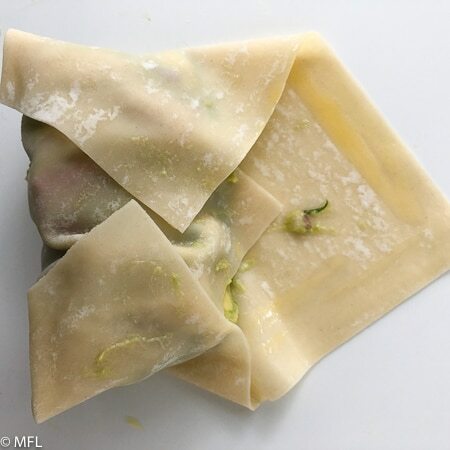 FYI I have recently been on a ‘filled wonton wrapper’ kick, and you can use water instead of egg to seal the wontons. I don’t have an air fryer (yet), so I will spray or brush on olive or canola oil and bake them. 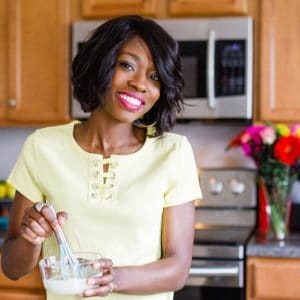 It should be the same result based on my past experiences with similar recipes.